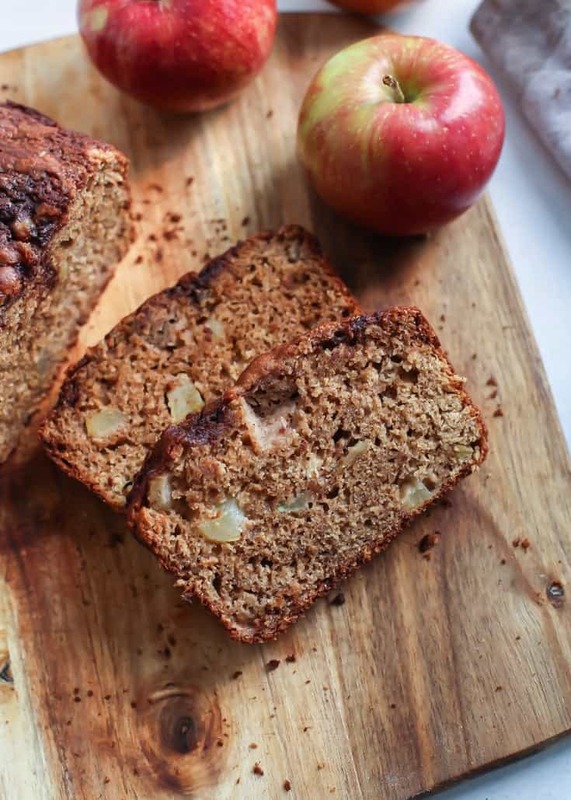 This Whole Grain Apple Bread is made with Greek yogurt, keeping the bread soft and moist. Tested with both whole wheat white flour and a 1:1 gluten-free flour blend. Top the loaf with a cinnamon swirl and this loaf gets an extra flavor boost. Do you believe in signs? I always think of the movie When Fools Rush In, with Matthew and Selma Hayek… Such a cute movie. I look at “signs” as the Universe trying to tell you something. Sometimes it’s as simple as when you’re thinking about a really old song you used to love, and then all of the sudden it pops on the radio out of nowhere. Or if you’re thinking about a friend you haven’t chatted with in a while and then you get a text message from them. It’s a crazy feeling right?? I’ve started The Universe Has Your Back and it reminds me that we are connected when we want to be. Connected to the world and the Universe, if we are open to it. I’m not really far into the book yet but when I got my first ever speeding ticket the other weekend (yes, my first ever) I was annoyed with myself but also okay with it at the same time. I thought, “Well, it could be worse…” I mean I was going 43 in a 25 (I was approaching a 55mph country road, okay?) and he wrote me for 5 over. And then someone told me the cops just do that to make you feel better. That was someone else’s (negative) perspective on the situation. And I wasn’t going to let their attitude change mine. I will say this though… for me to think about that situation (getting a speeding ticket) in a positive light doesn’t come naturally to me. Some people are conditioned at a young age to always see the bright side of things. But I honestly wasn’t one of those people. I look back on my childhood and realize anxiety was pretty prevalent. It’s not something I realized until a couple of years ago, but it certainly had an affect on my overall outlook. 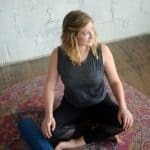 The good news is with self awareness and practicing gratitude, you really can become a much more positive person, even if it takes a little bit of work. Five years ago I would have been in that same situation freaking out, getting really mad about being written a ticket and constantly beating myself up about it for who knows how long. Now I look at the situation and can just let it go. And maybe letting things go also comes with age; the older you get the more you realize what actually matters and what things aren’t worth your time and energy. 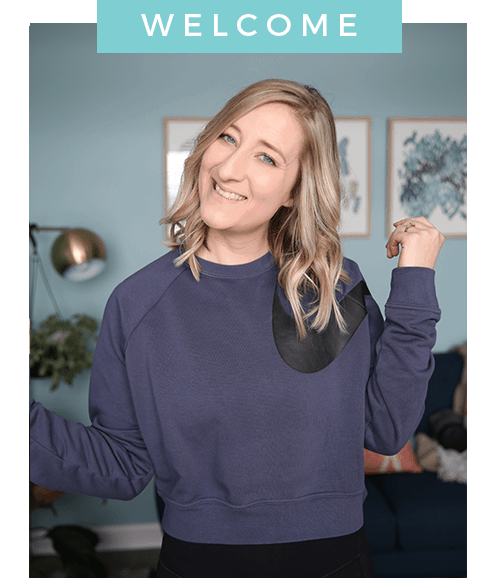 Are you naturally a positive person? Or does it take some work? Annddd now for today’s recipe 🙂 Whole Grain Apple Bread! Let’s chat about it. 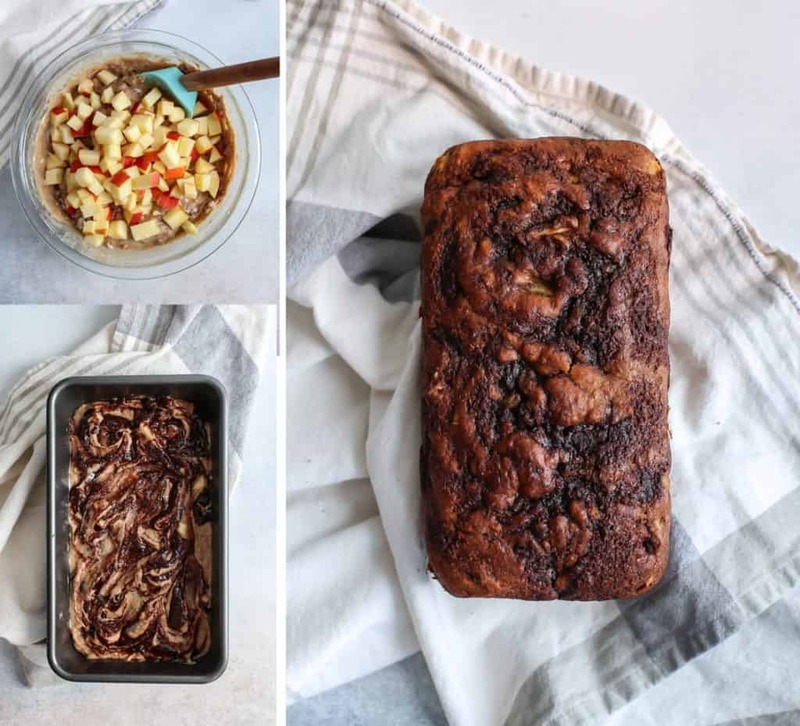 It’s just a simple quick bread loaf made with whole grain flour, applesauce, Greek yogurt, and of course, apples. I tested this bread using a 1:1 gluten-free flour blend and both turned out great with no noticeable texture differences. The greek yogurt helps keeps the bread moist but you should be able to sub a non-dairy yogurt if needed. Actually, if looking for a dairy-free recipe you can try these apple muffins. One of my favorites! OH almost forgot about the cinnamon swirl topping because why not? It adds a big flavor boost and a little bit of a crunchy top too. SO GOOD. And this apple bread definitely pairs well with some good ole peanut butter. Let me know if you give this one a try! Preheat oven to 375ºF and grease 9×5 loaf pan well, or line with parchment paper; set aside. In a medium bowl combine flour, ground cinnamon, nutmeg, baking soda, baking powder and salt; set aside. In a large bowl whisk together applesauce, maple syrup and sugar. Add in egg, Greek yogurt, oil and vanilla whisking again until smooth. Gently add dry ingredients to bowl of wet ingredients, stirring with large rubber spatula until almost combined. Fold in diced apples gently combining until dry flour is no longer visible. Set aside. Make the cinnamon swirl topping: in a small bowl combine melted butter, cinnamon and sugar until mixed. Pour batter into prepared loaf pan and drop dollops of cinnamon swirl onto top of loaf. Use butter knife to gently swirl in, being careful not to over-mix. Bake for 45-55 minutes, or until inserted toothpick in center of loaf comes out with little to no crumbs. Allow bread to cool in pan for 30 minutes before removing to cool on wire rack. Transfer bread to cutting board and slice with large knife. 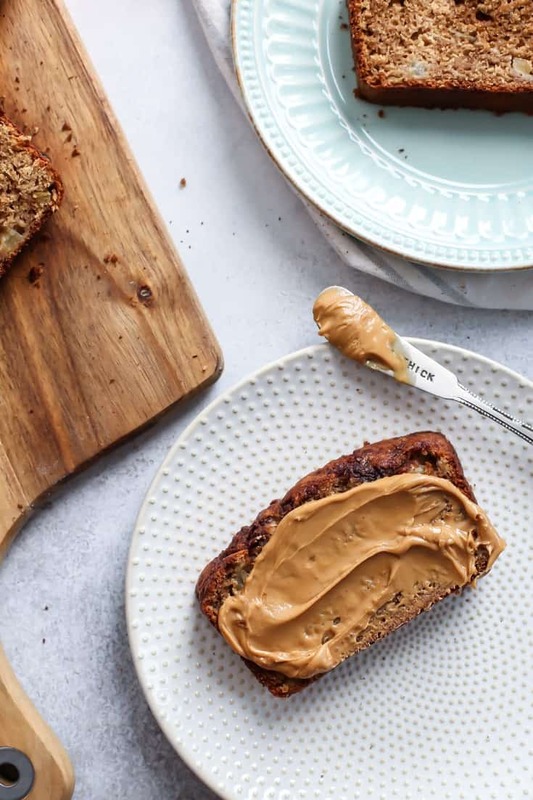 Best served warmed with your favorite topping: butter, coconut butter, cashew butter, etc. Enjoy! I don’t see the Greek yogurt in the recipe??:/. Am I missing it? How much greek yogurt is needed for the recipe? I see it in the post and subheader but not in the ingredients list! Hi Mackenzie, thanks so much for letting me know! Don’t know how I missed that part, lol. I’ve updated the recipe page now 🙂 Thank you! I’m glad you found a positive light through the speeding ticket experience! If I was in your position, I honestly would have been devastated and spent the rest of the day beating myself up for it. I don’t think it’s something I should do, but I’m working on being more compassionate with myself! Anyways, this whole grain apple bread looks amazing! I LOVE the cinnamon swirl inside! I might try substituting the Greek yogurt for coconut yogurt, flaxmeal for eggs, and coconut oil for the butter! The swirl adds such a delicious flavorful crunch! Hmmm…. It totally depends on the day, but I’m usually an optimist. Remembering that whatever happens is what God has for me is always encouraging, and it alway reminds me to look on the bright side. 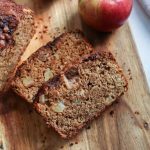 I LOVE apple bread as much as pumpkin bread; it’s so fun seeing so many apple and pumpkin recipes this fall! That’s great Emily! I think it’s great to be an optimist 🙂 I am definitely working harder on it! FYI the yogurt seems to be missing from the steps- luckily I remembered it from the instructions and just added it with the liquids. This turned out delicious! I was a little anxious because my batter was thick and I couldn’t really swirl in the cinnamon sugar mixture. However, I’m eating it for breakfast now and it’s perfect! Definitely on repeat this fall. Hi there! Thanks so much for letting me know about the yogurt step! I have added/updated. And yes the batter should be pretty thick, and I did keep the cinnamon swirl mostly on top. I am really glad you enjoyed the recipe! Thanks so much for stopping by and leaving feedback! Can you please suggest a substitute for the egg? I have a friend who loves cinnamon but doesn’t eat egg. Hi there! You can sub the egg by combining 1 TBS flaxseed meal + 3 TBS water – let sit for 3-4 minutes to gel up. And it can be used as a binder in place of the egg. Hope that helps!